Here at the dfki.de my life as a scientist begins. Reviewing means that other scientists read the work I am going to present at the conference and say if the work is ok or not. Its funny to have people that are experts in my topic to read my papers. Expecially when they are forced to read my paper. Hehe, I like conferences. I will eat cookies while reading the review results…. eh schon alt, aber immer noch gut. das fit-it programm in österreich zur unterstütztung von Semantic Web projekten. freut mich dass es sowas gibt! This is the page of the federal support for Semantic Web projects in austria. Cool thing to have, a state driven effort to do semantic web stuff. acutallly, semantic web is only a sub-interst here, but there are a few million euros for it. We are modeling our new, better version of gnowsis integration. – how does a adapter publish its metadata. Metadata of adapters are: What data do I contain? – what messages should be passed back and forth? adapters are accessed through xml/rpc, soap, or pure http. adapters can be implemented in any language, as long as they speak some http-speak. great zoot: a postcard that shows early photoshopping culture, made using analog tools. 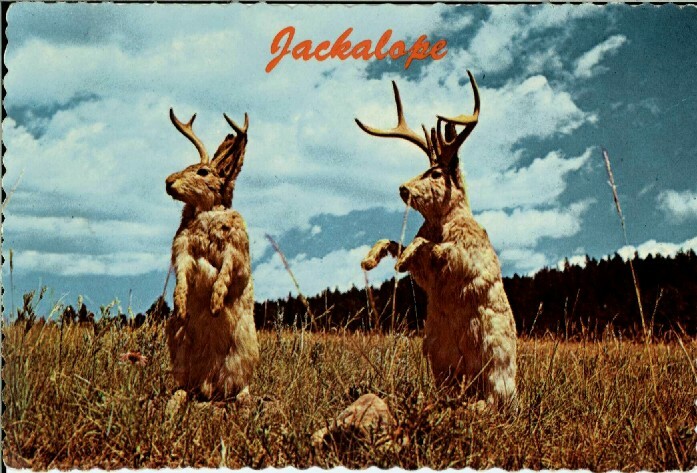 I stumbled across jackalopes during the last weeks, on some newsfeed or whatever, don’t remember. And then Ingrid and I found this postcard on a flea-market, and I had to buy it. The Faboulous JACKALOPE of The Southwest. Jackalope are the rarest animal in North America. A cross between a now extinct small deer and a species of rabbit, they are extremely shy and wild. None have ever been captured alive and this is a rare photo taken at their feeding grounds in the high country. Hier in Kaiserslautern regnet es jetzt andauernd. Fast jeden Tag regnet es. Dazwischen scheint so ab und an die Sonne. Kalt wirds auch. Manchmal schön, meistens der Planet des Ewigen Regens von Thomas D’s album reflektor falke. DublinCore to identify partOf / relatedTo things. The thing with RDF is, that concepts are also instances, in the view of RDF resource instances. So you need to seperate the concepts somehow from the instances. Example: how to render a FOAF file that contains facts about a Person, related Persons and facts about these related Persons? You then could code your UI and your logic behind to show related stuff in a seperate window (f.e. sidebar window) and have “part of” stuff in the “main window”. but more important, you can pass the knowledge behind on to the user. Its good to allow the user to “add new subparts” and to “add new relations”. So users have a guide what to put where. more to follow when I have coded these ideas…. well, meine neue heimat ist ja doch recht groovy. die haben opening, wird sicher geil. stephan und michael sind auch dabei. Michael Zeltner has pointed me again to the obvious. “Welcome to PLINK, a new way to find friends, and friends of friends! “watching as the semantic web grows”.